IT WAS QUINTESSENTIALLY American: born on the frontier, derived from the camp meeting experience, seeking freedom, and passing over centuries of tradition, creeds, and state churches. But even from the beginning it had a strong impulse toward world mission—seeking unity so that the world might believe in Jesus (John 17:21) and spreading the good news of Jesus to neighbors near—and very far. British churches had a separate origin from those in America—one that skipped right over Barton Stone. 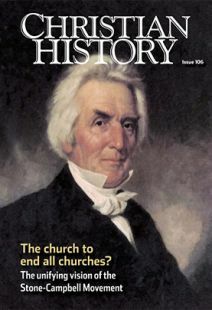 William Jones, minister of a Scotch Baptist church in London, was so influenced by the writings of Alexander Campbell that, in 1835, he began his own journal, Millennial Harbinger and Voluntary Church Advocate, to spread the same message. One of its first issues wrote off 2,000 years of church history: “The volumes of traditions, the cabalistic dogmas, the eastern philosophy, the pagan speculations . . . intercepted entirely, or totally eclipsed the light of the moral sun. Nearly all the earth was overspread in this darkness.” Jones soon influenced a group to leave the Scotch Baptists and form the first Churches of Christ in Britain. From these small beginnings grew a vibrant group of churches, planting new congregations all over the British Isles and spreading the gospel to Canada, New Zealand, and Australia. While not as large a group as their American counterparts, this Commonwealth stream produced many leaders who influenced the Stone-Campbell Movement worldwide. Stepping onto the global stage widened the church’s message beyond standard revivalist preaching. In Asia in particular, health care and justice issues stood shoulder to shoulder with church planting and evangelism (see “Freedom to speak, freedom to serve,” pp. 29–32). This new stage saw heroic efforts like those of Dr. Zoena Rothermel (1882–1979), a missionary to Maudha, India, who provided health care for thousands at a time when there were few female physicians anywhere in the world. She also regularly traveled by bike through the hilly terrain and climbed mountains at the age of 68—in some cases faster than her youthful companions! But difficulties loomed larger than simply riding bikes up mountains. Dire political realities plagued missionary efforts. In China, for instance, the church suffered many cultural upheavals—the 1937 Japanese invasion, World War II, the Communist revolution, and government debates on allowing more personal freedom. Yet, already by the end of the 1920s, the United Christian Missionary Society had entered the Yangtze River Valley in China in a significant way, and in an essential move of cultural sensitivity and practical wisdom, plans were already underway to transfer its leadership to the Chinese. Australians, Koreans, and many others soon joined the North American missionaries. Many Asian missionaries gave their lives or their health. For example, in Tibet in the 1920s, Dr. Albert Shelton and other missionaries established churches, schools, a hospital, and an orphanage. Attacked by armed robbers on a mission journey in 1922, Dr. Shelton died from his wounds. Sarah Andrews worked in Japan from 1916 until her death in 1961. She remained in Japan even during World War II, suffering imprisonment and deprivation along with the Japanese people she loved. After the war, she opened a home for widows. William Cunningham of Japan’s Yotsuya Mission sent the first Stone-Campbell missionaries from Japan to Korea in 1910. In 1933 he sent more. Americans arrived after World War II, planting churches and creating what are today Korea Christian University and Seoul Christian University. Even greater growth came in the Philippines. By the 1920s, Leslie and Carrie Wolfe had organized missions in Manila and Northern Luzon into the Christian Convention. Soon, regional conventions, Bible institutes, and church planting all flourished. In 1958 Filipinos assumed leadership of the convention. The Stone-Campbell Movement was still growing rapidly in Asia in the twenty-first century, but faced, as other Christians did, the challenges of being a minority in Asian cultures. Through the work of the United Christian Missionary Society, Jamaica and Puerto Rico boasted their own well-established Stone-Campbell churches by the 1920s. By the time other regions of Latin America were catching up in the 1960s, the Puerto Rican church had achieved full self-government as the Iglesia Cristiana (Disciplos de Cristo) en Puerto Rico. Puerto Rico was not only first in self-governing, but was also a formative influence in planting churches in many Latin American countries. In 1948 Lloyd David Sanders and his wife, Ruth, went to Brazil as missionaries—a dream Sanders had cherished since he was 12 years old. Settling in the Goias area, they began to plant churches. When Brasilia, the new capital of Brazil, was established in 1960, the Sanderses secured one of the first church sites there. Over 70 years of work resulted in over 300 churches, all led by Brazilian ministers. Today these churches support Brazilian missionaries in Mozambique, Angola, Guinea-Bissau, Mexico, Portugal, the United States, and India. By the twenty-first century, Stone-Campbell churches were found in every Latin American country. The Stone-Campbell Movement went to Africa in 1854 with the brief work of Alexander Cross in Liberia. But not until 1892 did Henry Elliott Tickle from the British Churches of Christ plant a mission that would last. Missionaries from the United States continued to plant churches in Africa after World War II. In most cases, they quickly established schools to train indigenous leaders. As a result, Stone-Campbell churches are led by local people who in turn plant churches in their countries and in nearby nations. Today there may be more Stone-Campbell Christians in Africa than in the United States. Stone-Campbell churches are found in 181 countries (see table at left, which counts both baptized members and children). Some churches have national or regional bodies. Most are strictly congregational. Gary Holloway is executive director of the World Convention of Churches of Christ and the author of 28 books on preaching, discipleship, and the Bible. Was—and is—the Stone-Campbell Movement “Evangelical”?